At the end of last year I held a raw desserts workshop for a charity event. One of my all time favourite recipes to demonstrate at workshops is my raw chocolate avocado mousse (here). Everyone’s always so surprised how easy the recipe is and even more so at how amazing it tastes, despite being made from avocados! I don’t make this mousse very often because, frankly, it tastes too good and I eat it WAY too fast. I’m still working on a sugar free/low fructose version, but I did create this sweet potato chocolate mousse (here) last year which I think tastes pretty damn amazing considering it’s completely sugar free! So the idea of a tart or cake made with my chocolate mousse seemed pretty epic, and after a brain flash to pair it with a raw chocolate brownie base this chocolate mousse cake was born. Even though this cake has two layers, they’re both made entirely in a blender, and if you want to save further on washing up you could just wipe out the food processor bowl between layers as they’re essentially all the same ingredients. The base is held together and sweetened by Medjool dates and I’ve given four options for the sweetener in the raw chocolate mousse topping. Coconut nectar or rice syrup are the lowest fructose options, followed by pure maple syrup and lastly raw honey. All work equally well, but will give slightly different flavours. If you’re not worried about the type of sugar then I’d suggest using pure maple syrup for the best flavour. 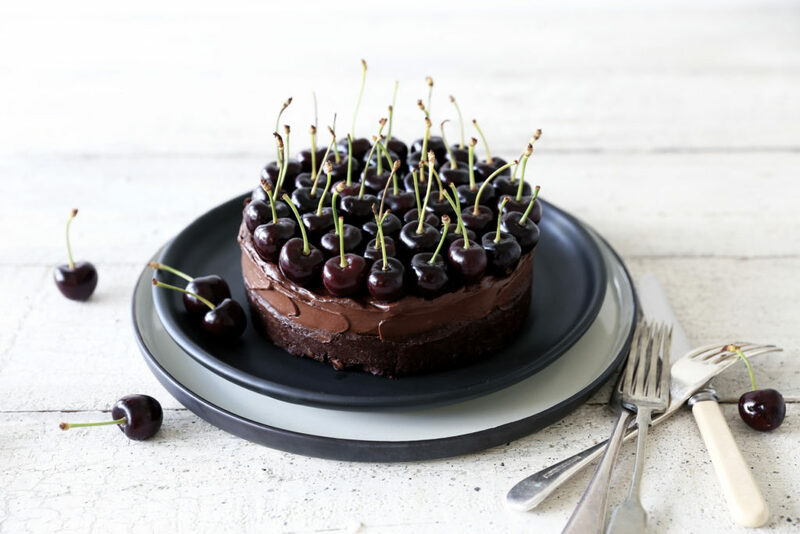 I topped this chocolate mousse cake with fresh cherries because they’re in full season at the moment, but you could easily top it with any fresh berries you like. If fresh fruit isn’t available to you, you could try drizzling it with a berry coulis or simply serve it naked in it’s full chocolate glory! Most raw desserts are so nutrient dense you often only need a small slice to satisfy, and this one is definitely no exception. Avocados are the main component in both the mousse and brownie base and are a brilliant plant based source of omega-6 fatty acids which are vital for the nervous system and brain. They’re amazing for your skin, reducing dryness and thereby providing anti-aging qualities. And not so well known are their anti-inflammatory properties which are amazing for soothing the gut. Brazil nuts provide the texture for the brownie base and are one of the best sources of selenium which is essential for thyroid hormone synthesis. They’re also a great source of magnesium which is required by all the muscles in the body including the heart. Dates glue the base together, and while they do contain a fair amount of fructose (the least desirable form of sugar), they also contain a high amount of fibre which slows down it’s absorption. They’re also a great source of potassium, iron, calcium, phosphorus, vitamins A and B6. 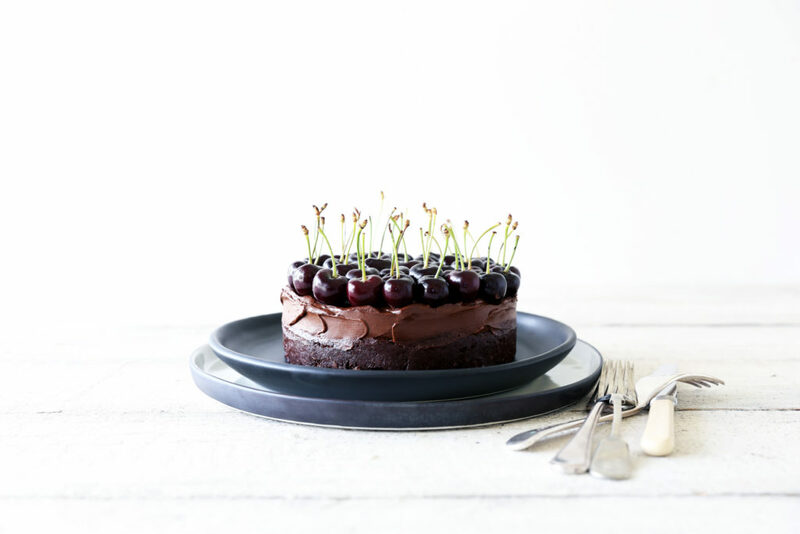 Raw cacao powder provides the intense chocolate flavour in this cake and is extremely high in antioxidants – even more so than your standard blueberry! Anti-oxidants are essential for reducing the harmful effects of free radicals which cause cell and tissue damage. Raw cacao is also one of the richest plant based sources of magnesium, a great source of calcium, and is full of mood enhancing neurotransmitters. Last but not least, the fresh cherries that decorate the top are an amazing liver tonic, cleanser and rejuvenator, and a great source of iron and zinc. When choosing cherries look for ones with the darkest colour as these are the most potent. As you can see this cake is full of amazing nutrients, but let’s not forget the taste! 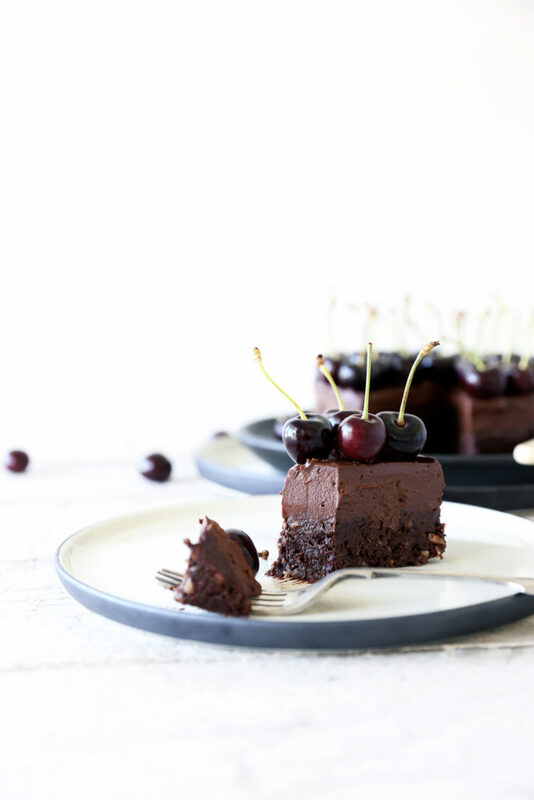 Smooth rich chocolate mousse atop a moist dense brownie base, finished off perfectly by the tart cherries. This cake is pretty damn amazing. Enjoy. Line a small 15cm cake tin with baking paper. To make the brownie layer, place the brazil nuts in a food processor and blend until they resemble coarse breadcrumbs. Combine with the desiccated coconut, place into a bowl and set aside. Gently melt the coconut oil by placing in a small heat proof bowl set over a pan of steaming water with the heat turned off. Combine the chopped dates, avocado, cacao powder, vanilla and salt in the food processor and blend to a smooth chocolately paste (this tastes amazing!). Add the melted coconut oil and blend to combine. Lastly add the brazil nuts and coconut oil and pulse until just combined. Press the brownie mixture evenly into your lined tin and place in the fridge to chill while making the chocolate mousse layer. To make the mousse gently melt the cacao butter by placing in a heatproof bowl set over a small pan of steaming water with the heat turned off. This ensures the temperature of the cacao butter doesn’t go above 46ºC and all it’s antioxidants are preserved. Place the avocado (peeled and stone removed) in a food processor along with the cacao powder, pure maple syrup, almond milk, vanilla and salt and blend until smooth. Slowly add the melted cacao butter with the motor running until it is all incorporated. Spread the mousse over the brownie layer and return to the fridge to chill. Prepare the cherries by washing well and allowing all the water to drain off, then giving them a light dry with a tea towel. This ensures when you place them on the cake they don’t drip creating water marks down the cake. 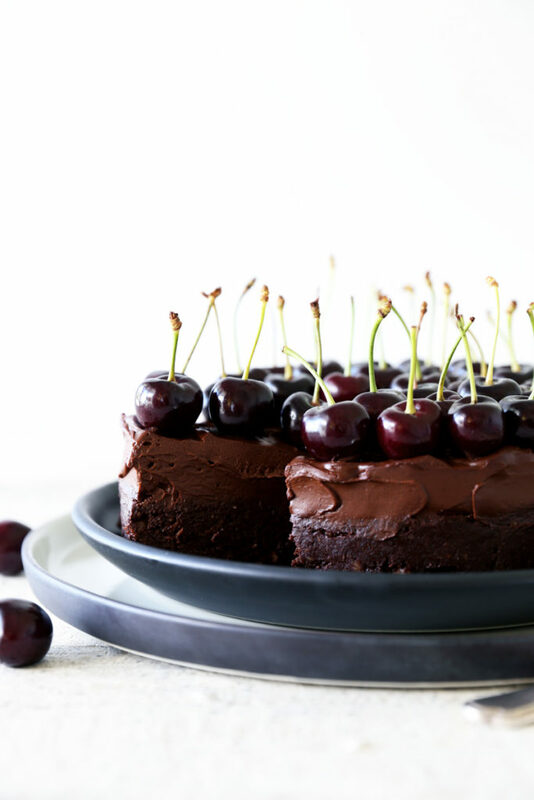 Remove the cake from it’s tin, place on a serving plate and top with cherries (or fruit of choice). This raw chocolate mousse brownie cake will keep chilled for up to 5 days or 1 month in the freeze when sealed well.